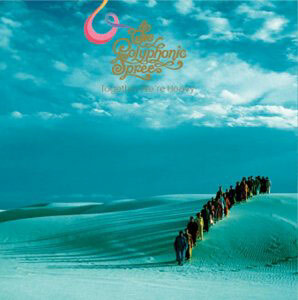 The fact that The Polyphonic Spree are the best live band around is not up for debate. In fact if you'd have asked their former record label they'd have problems arguing the fact. The simple problem is though while their live shows are joyous celebrations of life, the records have never really lived up to the promise bar a couple of great singles in "Soldier Boy" and "Hanging Around". "Together We're Heavy", the follow up to last years "The Beginning Stages Of...", is an album which is epic and ambitious and a truly glorious affair. With a low hum and the plucking of a harp it takes 30 seconds for the first burst of the full Technicolor Spree to come to life. Heavy drums collide with a fusion of brass stabs and choral harmonies before it all breaks back down to a lightly brushed piano motif and string quartet. A flute lightly floats in and Tim Delaughter utters the refrain "Until tomorrow the only voice was far away. Until tomorrow the only sound was my mistake". It's one of those classic Spree lyrical ideas wrapped up in hippy ideology, open to interpretation and when they go on to talk about a "new religion" and "doing more than yesterday" you get the feeling that he's starting off by admitting his own mistakes with the previous record. By the end of the song you can picture the band putting their hands to the air as they end with the closing line "Its the sun and it makes me shine", a hark back to an old school Polyphonic Spree song. After eight and a half minutes the first song is over. "Hold Me Now" is a much more conventional song. The piano jaunts along while a plethora of instruments float in and out of the mix throughout the song. Each listen brings out subtle measures they've thrown in to the pot and this is the joy on "Together We're Heavy". Even on what first listen is a conventional four minute pop song contains as many musical passages and twists as a four hour Proms event. "Two Thousand Places" is one of the new songs they played on their last UK tour and it's instantly recognizable. Lyrically it can be read on two different levels. On one hand it could just be a simple song about the pressures of being in the band. Look a little deeper and it's a song about the fundamentals of god and religion. "Suitcase Calling" starts off with a piano and an opera singer, before the drums take the song off into a waltz. Up till the four minute mark its a moment of subtlety which Tim Delaughter dearly tried to achieve, but as always with the Spree the bombast takes over and what at first was beautiful becomes over baked and syrupy. Still you've got to admire his audacity to take you from a moment of pure melancholy to uplifting joy and back again within the space of one song. The much touted ten minute plus "The Fool Becomes A King" sadly is just all a little too much. As a standalone EP track this would work perfectly, but as the penultimate track on an album it's a little overbearing. You get the feeling that nobody in the 30 strong spree had the guts to say 'Tim, this is just a little bit too much'. Like "A Long Day" on the debut album, "Together We're Heavy", the closing and title track of the album ends in unlistenable exploration of sound. "Together We're Heavy" is an album which pushes the boundaries and in hindsight will be looked upon as one of those classic albums that changed the face of music. While it's built on the foundation of "The Beginning Stages Of..." and matches the ideas and ambitions that Tim Delaughter had for the Polyphonic Spree, it's let down by a few moments of madness.